Old Hookers Guest House at the Bighorn River is a private vacation home in Fort Smith, Montana. Fort Smith is a fly fisherman's paradise because of its proximity to the famous Bighorn River, but we're also minutes from Yellowtail Dam and the scenic lake and canyons of Big Horn National Recreation area. This comfortable fully equipped house is perfect for families, reunions, small conferences and fishing parties. The house may be rented on a package basis (guided fly fishing and/or hunting with lodging, catered meals and maid service) or non-hosted (do your own thing). It has five bedrooms and four bathrooms on two levels, with a full kitchen, dining room for up to 10, screened in party porch, laundry room, fireplace, gear room and two lounging areas, each with a satellite TV. 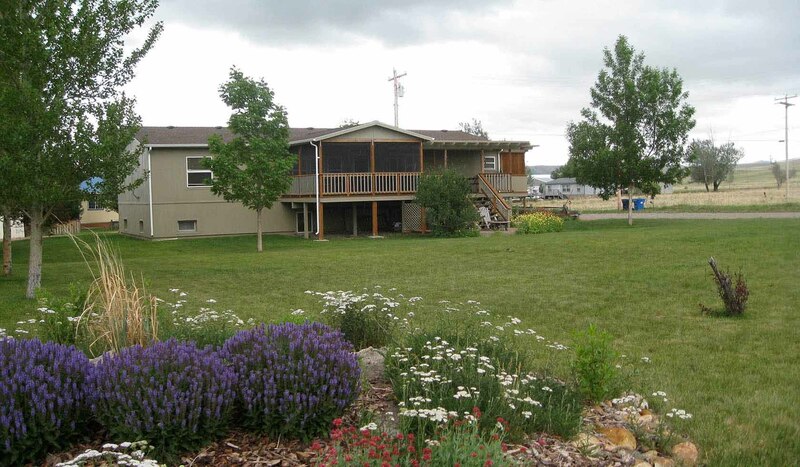 The yard is large with a grassy lawn, horseshoe pits, ample parking and a spectacular mountain-meadow view. The sleeping rooms are large, with all linens provided. Each room has two beds (full or queen), with 10 beds total, plus a fold-out couch. Each room is individually decorated to appeal to fishermen (hence the name Old Hookers), hunters and those who appreciate the Old West. The house is on the very edge of town, just minutes from Bighorn River boat ramps, yet still within easy walking distance to fly shops and the local market. Our property adjoins National Park Service, providing privacy, seclusion and a peaceful mountain meadow view. The deck has a gas grill, picnic table and Adirondack chairs, overlooking a spacious lawn that is ideal for casting practice. It faces the colorful, red foothills of the Pryor Mountains, offering a breathtaking view of the sunset over the Bozeman Trail. River floats and guided flyfishing can be arranged upon request through Eastslope Outfitters, owners of the house. Fishing gear is available to rent on-site, or ask for the 'Just Add Water' package, including guided fishing, lodging, gear and all meals. Tourist attractions nearby include Custer's Battlefield, Yellowtail Dam, and the scenic lake and canyons of Big Horn National Recreation Area. Old Hookers Guest House is located near the Bighorn River in the small town of Fort Smith, Montana, a 90-minute drive south of Billings. From Billings, take Interstate 90 to Hardin, then take Highway 313 southwest to St. Xavier, turn left and follow highway to Fort Smith.Old Hookers Guest House is located near the Bighorn River in the small town of Fort Smith, Montana, a 90-minute drive south of Billings. From Billings, take Interstate 90 to Hardin, then take Highway 313 southwest to St. Xavier, turn left and follow highway to Fort Smith.